“This came about through one of our staff meals at the restaurant and is a mash up of Indian and Italian dishes. Both are very comforting to eat, the sauce is spiced with warming spices similar to those used in Keema Matar ( a curried mince and peas dish), which the meatballs are cooked out in. They are served with linguini or spaghetti tossed in melted butter and fresh Corriander, but you could serve with a pilau rice if you wished. 1) Heat the olive oil in a saucepan, when hot and add the garlic and onion and sweat for 4-5 minutes until lightly golden. Pull to one side and cool down. 2) Place the minced meat in a mixing bowl and add the onion and the remaining ingredients mix very well and season. 3) Cook a little bit off to check the seasoning. Divide the mixture into 32 balls place on a try and refrigerate until needed. 1) Heat the oil in a casserole pan. Add the onions and cook for about 20 minutes until golden brown. 2) Whilst this is browning Place the spices in a frying pan and “dry roast” till fragrant, and grind to a powder. Add the spices to the onions half way through. 3) Place the garlic, ginger, and chillies in a liquidiser and blend until smooth. 4) Add to the onions and cook 5 minutes longer..
5) Add the tomatoes, passata and 250g water to the onions and simmer slowly until cooked out approx 20 minutes. Stir in the yoghurt, simmer for 2 minutes stirring add the peas and pour into a casserole. 6) While the sauce is cooking, fry off the meatballs in frying pan until they are golden and cooked trough. 8) Serve with the spaghetti, cooked, drained and tossed in the melted butter with lots of black pepper and the chopped coriander. 1) Cook as manufacturer’s instructions. Keeping al dente. 2) Drain and toss in melted butter with 2-3 spoons of the sauce and the corriander. 3) Season well. 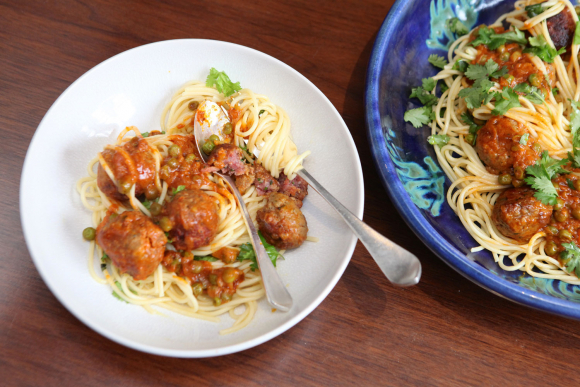 Serve in a bowl with the casserole to the side, or make a nest with the spaghetti, spooning the meatballs in the middle.